About one in 5,000 people—or 1.2 million people worldwide—have hereditary hemorrhagic telangiectasia (HHT), a genetic disorder of the blood vessels sometimes referred to as Osler-Weber-Rendu syndrome after the three doctors (American, English, and French, respectively) who studied HHT more than 100 years ago. Originally thought to be a special form of hemophilia, HHT is now recognized as a separate disorder that affects both men and women equally and people of all ages. Before Henri J. L. M. Rendu’s work, physicians didn’t realize that people with HHT have abnormalities of their blood vessels and not a clotting problem. “Because HHT is autosomal dominant, it is inherited by 50% of the first-order family members,” says Scott O. Trerotola, MD, an interventional radiologist and the codirector of the HHT Center of Excellence at the University of Pennsylvania School of Medicine in Philadelphia. Patients with HHT tend to form blood vessels that lack capillaries between an artery and a vein. As a result, arterial blood under high pressure flows directly into a vein; normally the blood has to squeeze first through very small capillaries. When an artery is connected directly to a vein, it tends to be fragile and can rupture, resulting in bleeding. A small blood vessel that is abnormal in this manner is called a telangiectasis. A lesion involving larger blood vessels is called an arteriovenous malformation (AVM). Whether a telangiectasia or an AVM, the basic abnormality in the blood vessel is the same. Telangiectases often occur at the surface of the body, including the skin and the mucous membrane that lines the nose. Almost all HHT patients develop at least a few telangiectases (small red or purple spots) on the skin of their face or hands by the time they reach middle age. Ninety percent to 95% of all HHT patients also will experience nosebleeds by the time they are adults. Some experience severe nosebleeds while others have only infrequent and minor nosebleeds, though most fall somewhere in between. AVMs tend to occur in the internal organs—most commonly the lungs, gastrointestinal tract, brain, and spine, in that order. Abnormal blood vessels also are common in the liver. No one knows why the abnormal blood vessels occur in these organs and not others, Trerotola says, it is rare for HHT patients to have all the manifestations of HHT. Between 30% and 50% of patients with HHT have AVMs in their lungs, which is Trerotola’s main concern. These pulmonary AVMs (PAVMs) are poorly understood, he says. Little is known about their history or growth rate. Between 5% and 20% of patients have an AVM in their brains. They also are present at birth. Lung and brain AVMs need to be detected and treated before they cause serious problems, Trerotola says. While liver AVMs are not time bombs like those in the brain and lungs, PAVMs are at risk of rupturing, particularly in pregnant women in whom blood pressure and blood volume tend to increase. A rupture could lead to life-threatening bleeding. Trerotola says the greatest risk for patients with PAVMs is stroke or a brain abscess, which also can be life threatening. “In the normal lung,” he explains, “the capillaries between an artery and vein serve as a filter for impurities in the blood, including clots, bacteria, and air bubbles. The impurities are removed before the blood circulates to other parts of the body, including the brain. But when one or more AVMs are present, these impurities can pass through the AVM, go to the left side of the heart, and then on to the brain and other organs. The good news, Trerotola says, is that PAVMs are usually easily treated with embolotherapy and, as his research confirms, even more so today. “PAVM embolization, which was developed by Robert White, MD, now at Yale University, has been the standard of care for more than two decades,” he says. Patients should be treated regardless of whether their PAVMs are symptomatic, he says, because of the risk for strokes, brain abscesses, and other complications. Traditionally, PAVM embolotherapy has been performed as an inpatient procedure, often involving several hospitalizations in the case of multiple PAVMs. 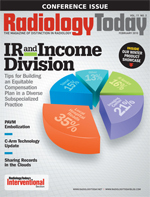 “Multiple procedures are the rule rather than the exception,” says Trerotola, who is hoping that his study, “Outpatient Single-Session Pulmonary Arteriovenous Malformation Embolization,” which was published in the October 2009 issue of the Journal of Vascular and Interventional Radiology, will help change the standard care. Trerotola’s retrospective study, which is coauthored by Reed E. Pyeritz, MD, PhD, and Barbara A. Bernhardt, MS, covers four years from March 2003 to April 2007. During that time, 51 patients (14 male and 37 female), 47 of whom had a confirmed HHT diagnosis, underwent outpatient embolization in 63 procedures. Multiple procedures were performed if the PAVMs were too numerous for a single-session treatment or if the patients were being treated for PAVMs that had recurred. The patients ranged in age from 15 to 78, with a mean age of 44. Trerotola is excited that any patient with up to four PAVMs can be treated in a single outpatient setting. “I can treat them 100% of the time in a single setting,” he says. However, if they have more than four PAVMs, “it’s 0% of the time. It’s a very sharp cutoff.” Patients with more than four PAVMs will need multiple sessions, but those, too, can be performed on an outpatient basis, Trerotola says. The issue when a patient has more than four PAVMs is the amount of contrast that can be used for the procedure. “There is also a fatigue factor,” he says, “but the reality is you can only use so much contrast, and you have to stop because you’re at the contrast limit for the day.” A limit of 350 mL contrast agent volume was used in the Penn study. Trerotola says at Penn’s HHT center the belief is that any accessible PAVM should be treated. Some interventional radiologists adhere to a 3-mm rule that says a PAVM’s feeding artery should be at least 3 mm in diameter. However, Trerotola says, refinements in digital subtraction angiography, catheter systems, microcatheters, and coils make it possible to treat PAVMs with feeder vessels 1.5 mm or smaller. Further, reports have been published in which patients with feeding arteries less than 3 mm have had symptoms. “We treated any PAVM that we could find and reach with a catheter at the time of pulmonary arteriography,” he says. Patients are screened for PAVMs with contrast echocardiography. A saline solution containing microbubbles is injected into the patient. “The cardiologist isn’t looking for the immediate showing of the bubbles in the left side of the heart. That would be an intracardiac defect that also can cause a paradoxical embolism. It should take several beats before the bubbles are seen coming back through the lungs. If the cardiologists see slightly delayed bubbles, that’s an indication of a PAVM,” explains Trerotola. If the echocardiogram is positive, the next step is a CT scan, which will indicate the size and number of PAVMs. The embolotherapy, performed under moderate sedation, takes anywhere from one to four hours, depending on how many PAVMs are being treated. Ultrasound guidance is used for femoral or jugular venous puncture, and a vascular sheath is placed and connected to an air-free flush system. “It is treated with the same care as an arterial catheter,” Trerotola says. Patients in the study were given heparin but not prophylactic antibiotics. Diagnostic arteriography is performed. After the diagnostic study, a catheterization is performed. In the study, the embolization was performed with a variety of devices, including shaped platinum coils, long platinum coils, detachable platinum coils, and nitinol plugs, as well as platinum microcoils. Stainless steel coils were rarely used. “Additional shaped diagnostic catheters were used as needed through the guiding catheter,” Trerotola says. The procedures are not particularly long. The mean fluoroscopy time for patients in the study was 34 minutes, and overall room time was 134 minutes. Thirteen PAVMs (8%) were complex, and 62 of the 154 PAVMs (40%) treated had a feeding artery smaller than 3 mm in diameter; 18 (12% of the total) had a feeding artery smaller than 2 mm. Patients recovered for two hours and then were sent home. They were instructed to take ibuprofen (or acetaminophen if they had severe nosebleeds) if they developed chest pain, a common side effect. In a one-month follow-up at the clinic, patients were asked about postoperative pain or other complications. A few reported transient chest pain, and one patient who had a history of migraine developed a headache on the day after the surgery. A brain MRI showed a tiny new lesion thought likely to have resulted from a paradoxic embolus (a kind of stroke) during the procedure. “No patient required hospital admission and only one patient, the one with the headache, returned to the clinic on day one,” Trerotola says. Trerotola says the importance of a single-session PAVM treatment is that patients who are asymptomatic are often reluctant to undergo treatment out of fear of the procedure itself or the impact hospitalization could have on their lives. “That’s why any refinement in PAVM embolotherapy that can reduce the impact on a patient’s life could help increase compliance,” he says. “We have established that if a patient has four or fewer PAVMs, we can confidently tell them there is a high likelihood of success in treating them in a single outpatient session.” Avoiding hospitalization also has obvious benefits, he says, including lower costs to the healthcare system.